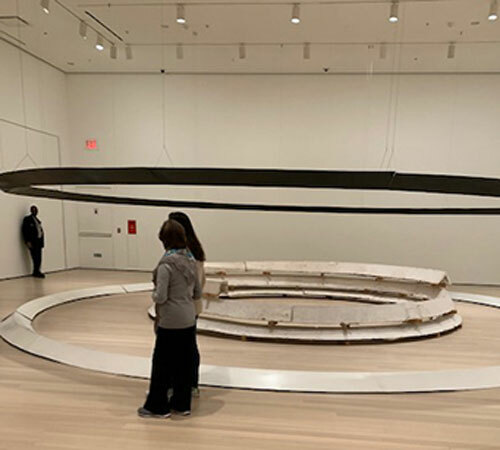 The question arose for the Steiny Road Poet when friends took her to see Part I of Bruce Nauman’s Disappearing Acts at the MOMA in New York (Oct 21, 2018 - Feb 25, 2019). Part II is in the MOMA PS1 in Queens. 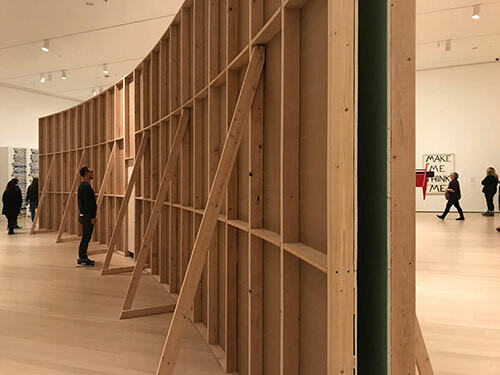 It’s a huge retrospective of Nauman’s art but most of it is tucked away in the less visited MOMA Queens location giving weight to the curatorial title Disappearing Acts. 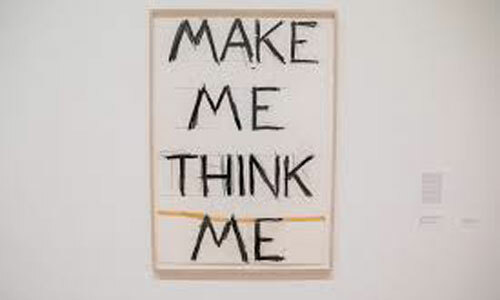 The mid-1960s is when Nauman began exhibiting his work and Wikipedia under “Conceptual art” lists Nauman as a “Notable conceptual artist.” It seems to Steiny that Nauman’s Conceptual art continues, as does the approach in the work of other artists. Yup, there are no easy answers. Not from the full room-sized sculpture that looks like a space ship. Most troubling was the billboard-like structure with a locked door. A sign on the door read that one could go down a floor in the museum and get a key, but only one person per hour could do this. You could see from the ends of this huge structure that there was little space between the two walls and nothing much to look at, except a colored set of walls. Was this some Buddhist re-do on sitting zazen—open the door, squeeze in, and stand there. Why would anyone want to do that? Worse, what would happen if you closed the door and got locked in? ANNOYING THE VIEWER ENOUGH TO WHAT? Also according to Wikipedia, Marcel Duchamp’s readymade 1917 sculpture “Fountain” (a wall mounted urinal) was a precursor to conceptual art. 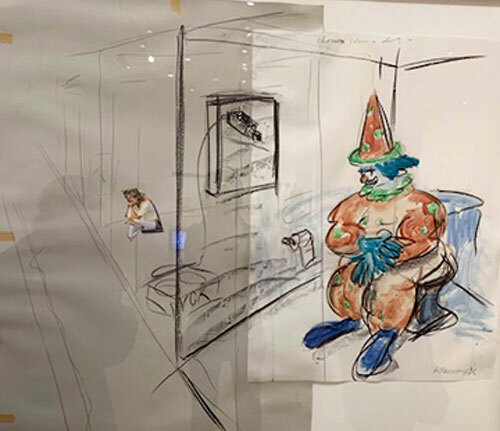 Should Steiny mention the portrait of a clown sitting on his throne (a toilet)? Apparently Nauman once exhibited a series of artworks he called Clown Torture. It was one of his series of repetitive structures (including videos) that the artist hoped would make the viewer annoyed enough to think. Influences on Nauman include philosopher Ludwig Wittgenstein, experimental composer John Cage, minimalist composer Philip Glass, first minimalist composer La Monte Young, sculptor/printmaker HC Westermann, playwright Samuel Beckett, performance artist Meredith Monk. And yes, Disappearing Acts includes a cacophonous sound sculpture that takes up a large space and is like walking through broadcasts of several radio stations with different programs. To check what Steiny learned, she returned to home base and decided she would find another conceptual art exhibition. At the Smithsonian American Art Museum was Sites Unseen by Trevor Paglen (June 21, 2018 – January 6, 2019). (The exhibition moves to The San Diego Museum of Contemporary Art February 21 – June 2, 2019.) Paglen, a MacArthur Foundation winner, combines stuff of surveillance (sometimes gleaned from Freedom of Information Act requests), geography, politics, science for his art-making. To Steiny, Paglen’s unbeautiful art is nothing to what goes on behind the scenes of the piece. Therefore, what the viewer doesn’t see is more important than the product made by the artist. Consider Code Names of the Surveillance State. 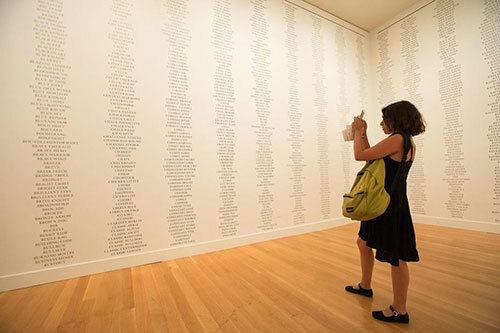 This set of secret code names collected from the US National Security Agency (NSA) was displayed on several walls—floor to ceiling—of the exhibition space. What Paglen is suggesting is the enormity of secret projects in which the United States of America has engaged. Is this information art? Is this information as displayed a type of poetry? Are these 20 columns of centered words just a design piece? It’s up to the viewer to decide. 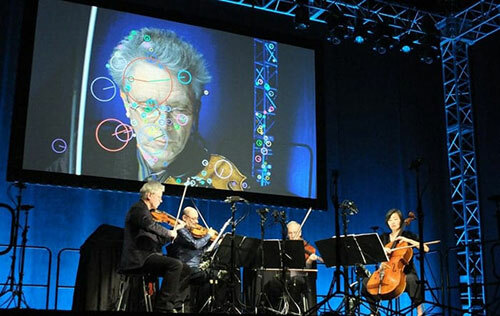 Most fascinating to Steiny was “Sight Machine,” a video of the Kronos Quartet playing a live concert where everything about them—facial expressions and movements—is analyzed with various kinds of machine vision algorithms, including face detection for iPhones and guided missile surveillance. So it seems to Steiny that post modernists (those coming after the Modernists)—and this includes Gertrude Stein and these conceptual artists like Nauman and Paglen—all made or make it their goal to goad their audiences into thinking about what they are experiencing. The question is how to get the audience engaged enough so each person will think through what the artist is presenting. Whether the audience like what they are experiencing or find it beautiful or pleasing is not the point. The point is being fully alive by thinking.